Yes, so, as soon as it started getting warm around here, Tom and I forgot every single well-meaning resolution we had made concerning the importance of pacing ourselves with landscaping/planting gardens. 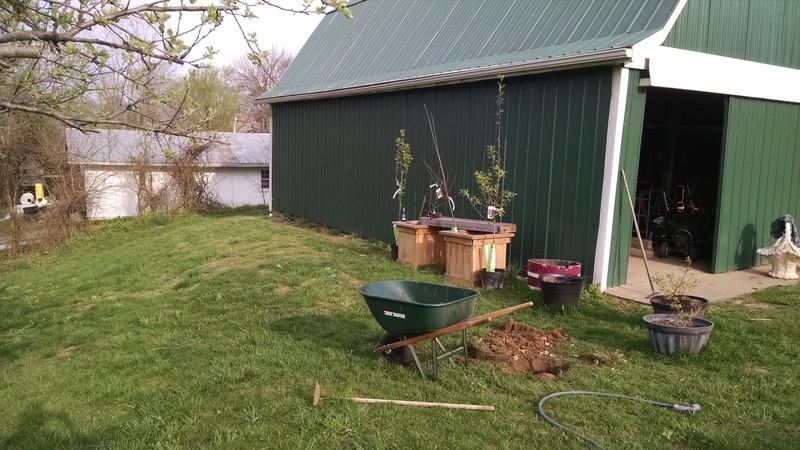 WE LOVE GARDEN CENTERS and we’ve planted an orchard and are working diligently to make the side garden happy as well. There are just so many awesome things we can do outside that we can hardly wait to get into them!!! HOWEVER, before we get into all that, an update on the kitchen! Because it’s really finished now, except for some bits of trim here and there. 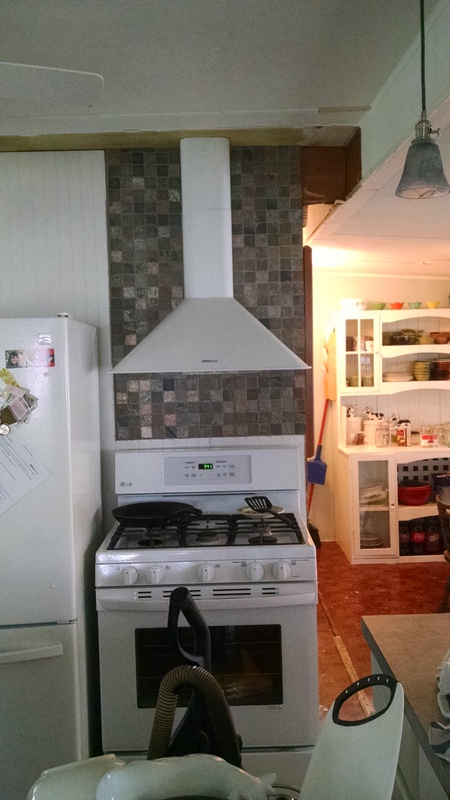 Pop installed our new stove hood and redid the wall behind the oven and fridge, so everything looks super happy! So apparently I don’t have a good “before” picture of the fridge/oven wall (surprise, surprise), but you can see a bit of it here. 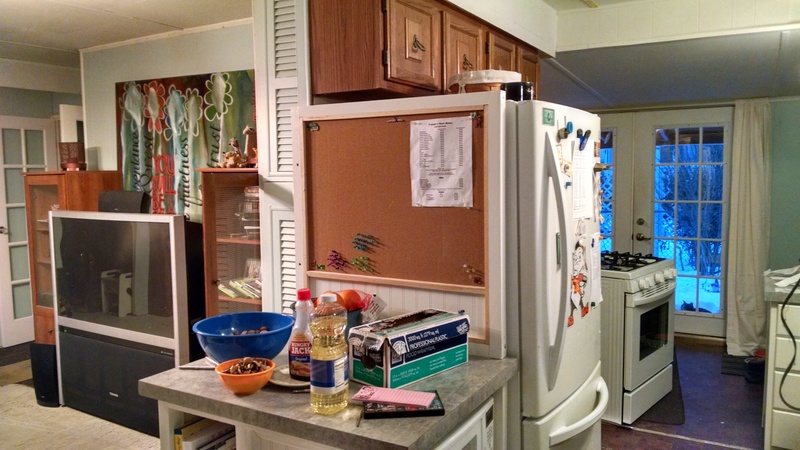 Basically, we had some ugly cabinets over the top of the fridge, plus a weird fake board thing above the cabinets that makes it look like it’s holding up the ceiling or doing something useful, except it’s not. Behind the oven, which you can’t see from here, the wall was partially tiled with white squares, several of which were missing and/or had never been there to begin with. 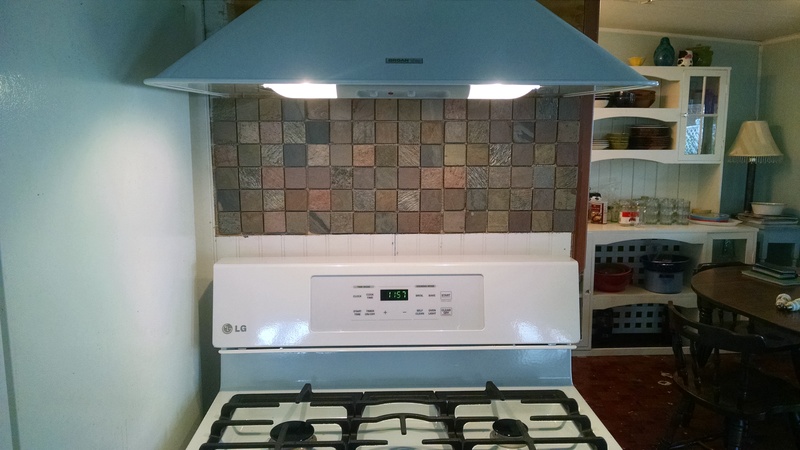 The stove hood was stainless steel, old, ugly, and recirculated air (through a filter) rather than actually venting it out of the kitchen. It also sounded like a jet engine when it was running. Day One involved, of course, demolition. 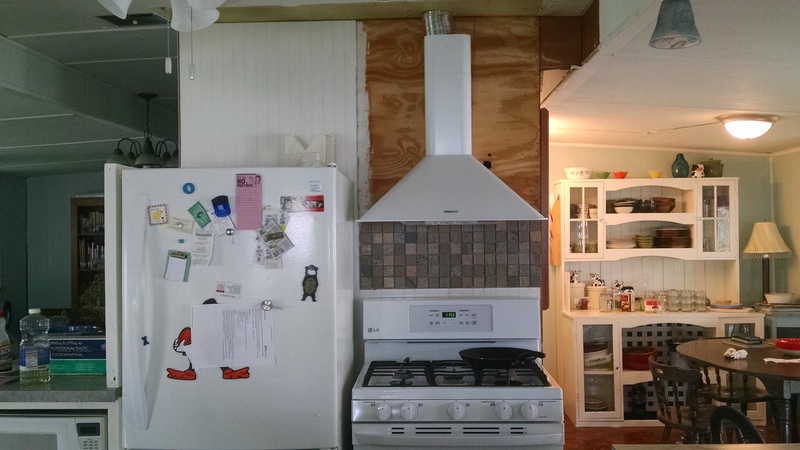 When we got home from work, the cabinets, tile, hood, and weird board were all missing. It immediately felt like the kitchen was taller! In case you’ve forgotten, this house has ludicrously low ceilings. It boggles my mind how so much of the stuff we’ve replaced were things like low-hanging lights or stuff up against the ceiling – things that made the house feel even more cave-like. 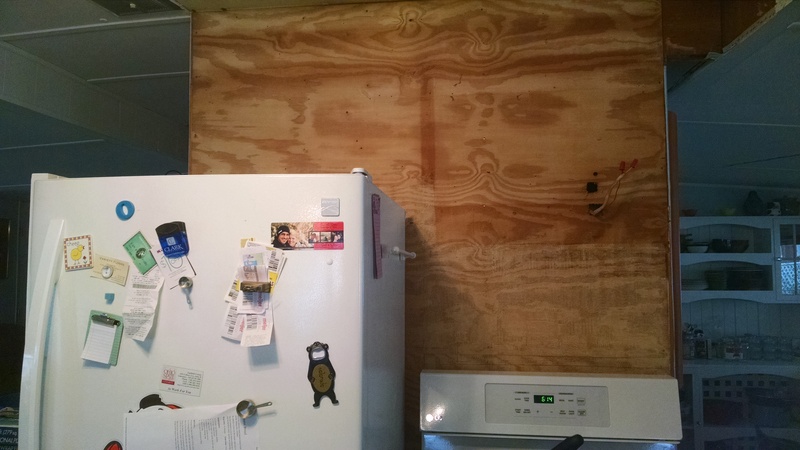 By the end of Day Two, the paneling behind the refrigerator was up. 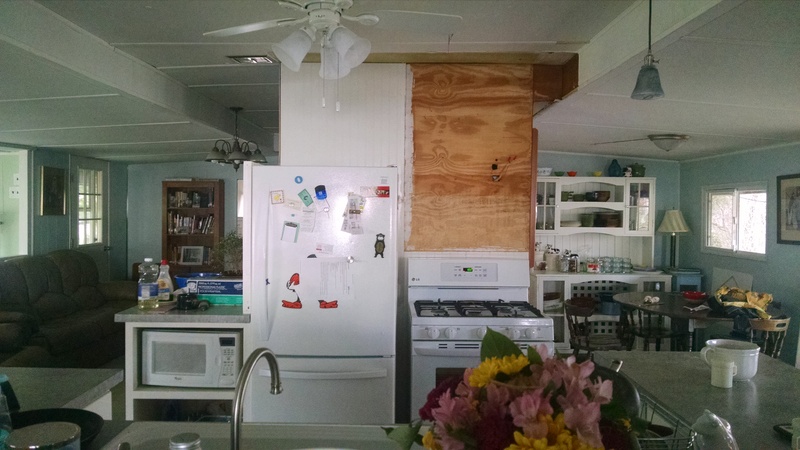 This is actually the same beadboard that we used on the backs of the cabinets and for the kickboard in front of the bar stools. 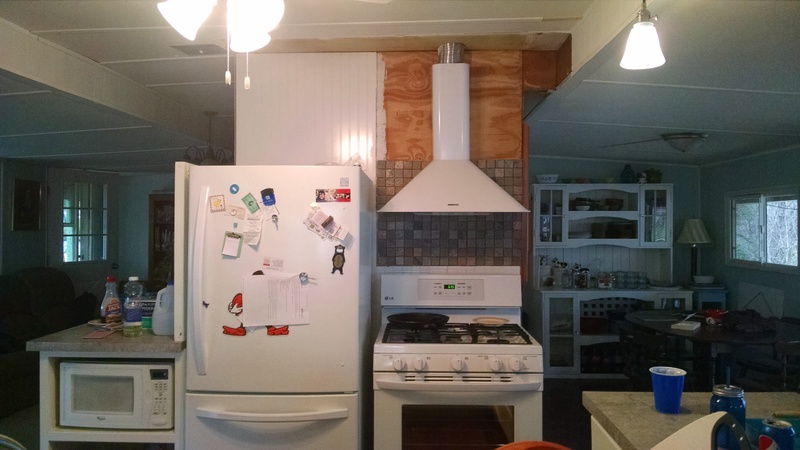 We thought about getting a sheet of regular paneling, which is what is on most of the walls, and then painting it the blue of the rest of the walls, but that all just seemed like a lot of hassle, especially when we already had the beadboard leftover! Day Three was the big change – the new hood was in!! Even though the fan wasn’t connected yet, the lights worked and Pop had started to install the stone. It’s the same as we used for the backsplash for the kitchen sink, and has a lot of grays, so it matches our color scheme really nicely. We wanted something that would contrast since we have two white appliances and a white hood and one sheet of white paneling all right together. One of the reasons Tom chose this particular hood was because it has two 40-watt bulbs. 80 extra watts of light in the kitchen really makes a big difference. While we love having the kitchen in the center of the house, and while removing the walls has definitely lightened things up considerably, it can still be rather dim in there, especially on cloudy days. I am very pro-lots-of-lights anyway. This brought us to the end of the week. On Saturday, Tom and I went to Cleveland to visit our new puppy – we’re getting a border collie in May!! Super stoked!! 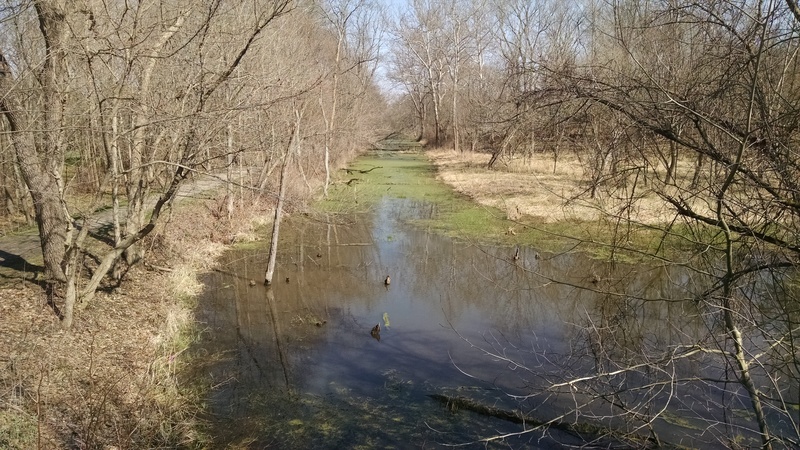 Much of the park follows the route of the Ohio & Erie Canal; the old tow path is now a hiking/biking trail. There are a couple of museums and whatnot as well – it’s a park I think we’ll try to visit again sometime. I did find myself thinking that I wouldn’t want to be there during mosquito season, though. 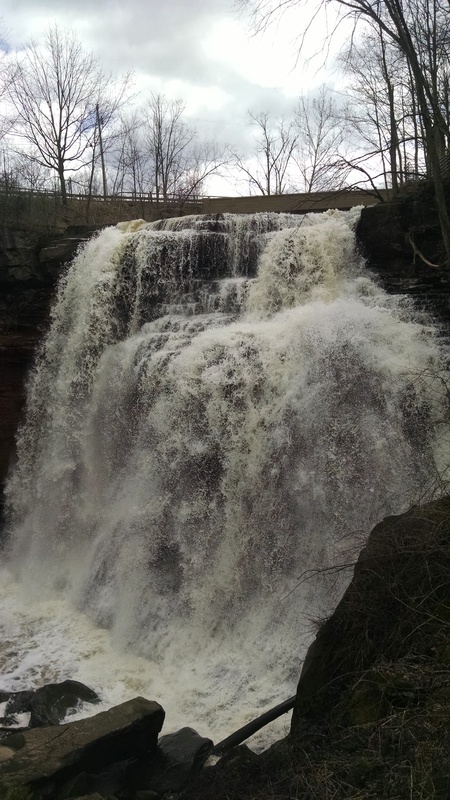 Brandwine Falls are pretty nifty, actually. It’s hard to believe that you’re actually practically in Cleveland. When we got home, Pop was cleaning out the “other” side of the barn. 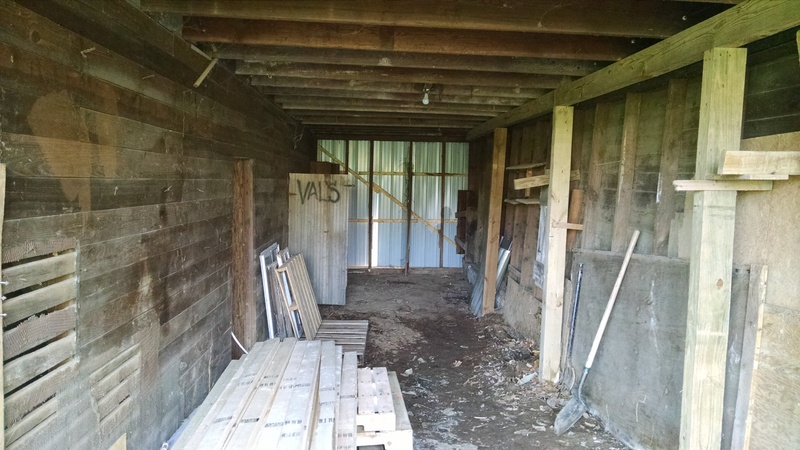 The left (main) side of the barn is the side I’ve posted pictures of before – concrete floor, and Tom’s work area. The loft, which is slowly becoming a nifty rec room, is over the entire barn. 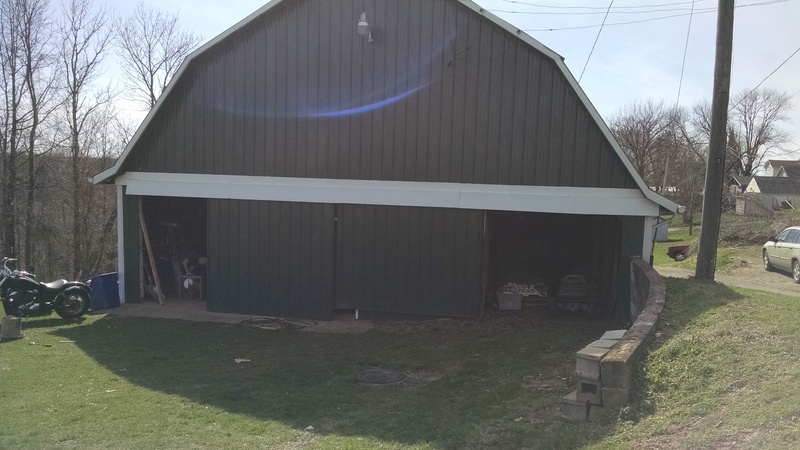 The Other Side is a long, narrow room that runs along the alley-side of the barn – basically, it’s only as wide as the doorway pictured. This side has been full of random junk for many years. Most of this stuff, including an old boat, actually belongs to Pop – the old owner of our house was letting him store stuff in there. I’ve been really wanting chickens, though, and they’re going to go in the back of the barn. We were thinking of waiting until next year for this project (let’s be honest, I think Tom was hoping that this project would be next year’s), but lo and behold, Pop was working like a man with a mission to get that thing cleaned out. So that ended up being the rest of the weekend. There’s actually quite a lot of space without the boat! The chickens are going to go in the back (Val used to keep them there, too, as you can see on the door!). We’ll cut a doorway to the outside, where Tom is building a chicken run, put in some windows, and frame in a wall to keep the chickens towards the rear of the building. Mom is getting chickens, too, so she and I ordered them together from Mt. Healthy. You can purchase just one pullet of each breed from there, which was exactly what we wanted – who wants all their chickens to look the same?? I ordered eight and am SO EXCITED. While the guys were doing their thing, I was working on the side yard. This is actually a middle-of-the-task picture. When we moved in last year, this area was wall-to-wall shrubs. 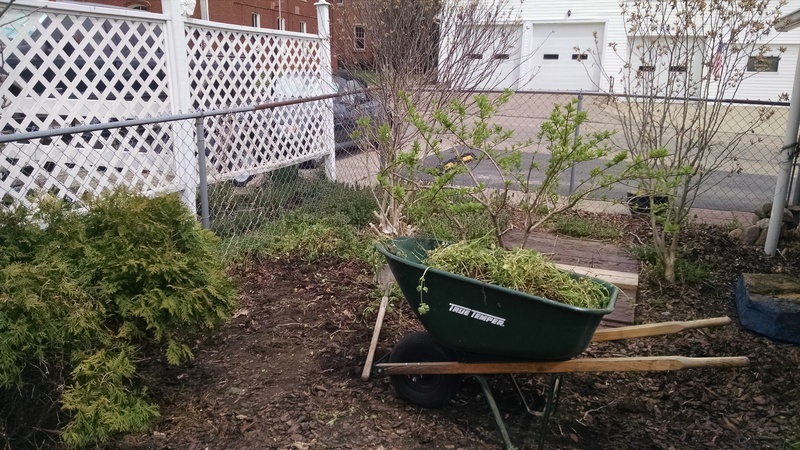 We’ve cleaned out a lot of that, and are not down to a few hibiscus, a burning bush, and a hydrangea. Last summer, we threw down a bunch of mulch, so I’ve actually been working on clearing that back out so we can plant a lot of stuff in here. Some of the mulch will probably go back in this garden eventually, and the rest will get used for various other projects. Even though the kitchen didn’t look a lot different when we got home from work the next day – just a bit more stone – the biggest difference was in the unseen… the fan actually vents out through the roof now! By Thursday, this project was in the bag! Doesn’t the stone look amazing?!??! I absolutely love it. Of course, the ceiling still needs painted, and we’re going to run some trim between the stone and the wood, but overall the kitchen is now pretty well set, and I am a super happy camper!!! So now we are up to this weekend, and a very busy weekend it has been! Saturday was perfect weather in every way – topped out in the low 70’s, the sun was shining, a gentle breeze – just perfect. We knew we wanted to be working out in it, so we hit up Lowe’s and Wilson’s Greenhouse in Newark first thing in the morning. Back home, we set to work on the side garden yet again. 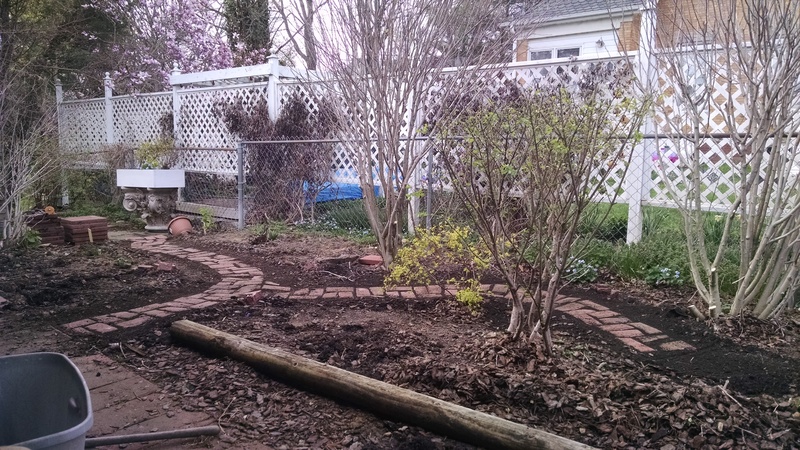 I continued to work on the mulch/weeding situation, while Tom began to work on setting a couple of small paths through the garden. Even though this area is on the north side of our house, it’s actually in the sun most of the day. So much of this garden will hopefully be herbs. We’re also planning a small pond, and, where you can see the wooden platform in the next picture, a pump. There’s an old cistern underneath the platform (actually, under about a third of the garden) that is probably there from the days when our barn sat where our house is. At that time, the barn belonged to the huge brick house on the corner, and the roofs for both buildings drained into the cistern. When the barn was moved, somehow someone ran the new downspouts from our house into that same cistern. We’re planning to put in a hand pump and use the water for gardens and whatnot. The side garden has a lot of ground ivy, aka Creeping Charlie. I spent a great deal of time digging out the roots yesterday, but I’ve no doubt that much of it will still return. There have been a lot of challenges surrounding this little area. 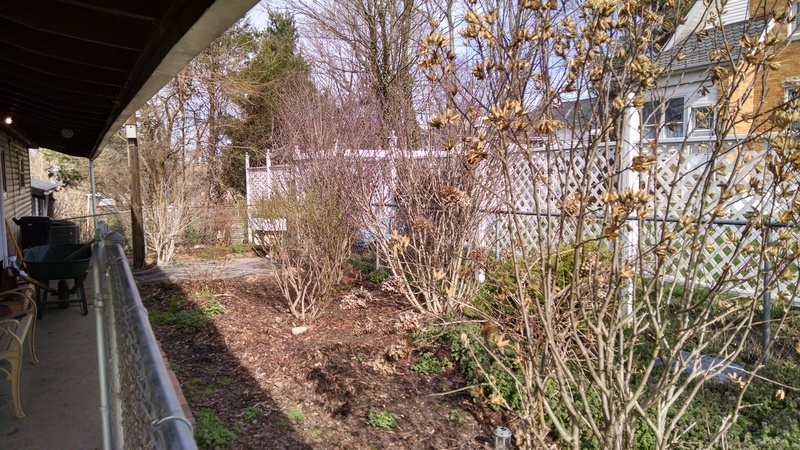 In the lefthand side of the picture you can see a couple of evergreen shrubs. These shrubs were basically the entire garden last year, with some hibiscus thrown in for fun. At some point in this garden’s lifetime, someone thought it would be a good idea to put down some burlap fabric and then mulch over it. This would have been find, except that was probably ten years ago, and now there is about 3″ of soil over top of the burlap. We pulled out yards of it last year, and I’m still digging it out this year. Good times, good times. Anyway. So I really wanted a couple of narrow paths through the garden, both for practical use and aesthetic. 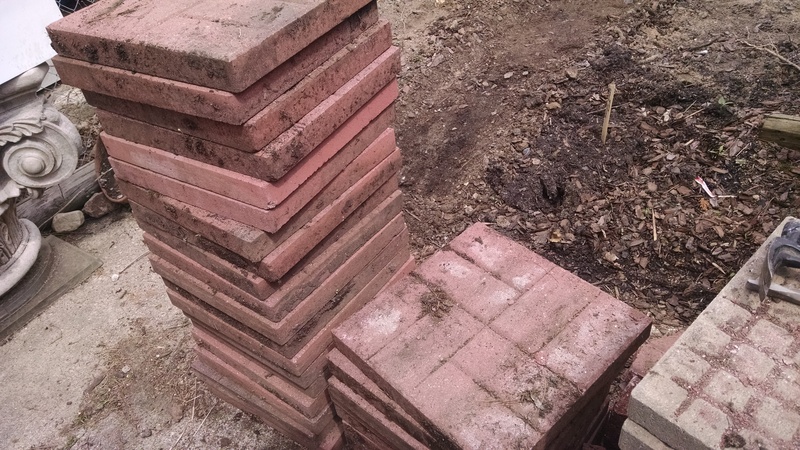 We didn’t have any spare brick laying around, but we did have these square pavers. I think the previous owners must have gotten a good deal on these pavers, because they are all over the place. 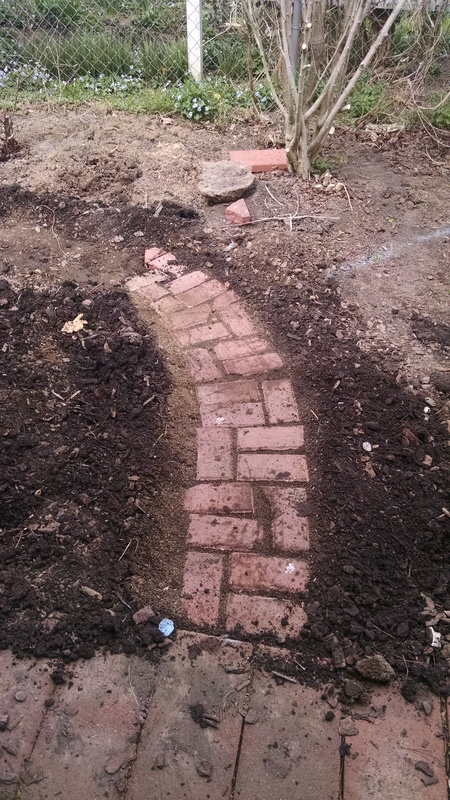 As is, they are bit a larger than what I had in mind for the path (and they don’t do turns very well), but Tom was pretty confident that he could use a chisel and split them into individual bricks – and he did! Ta-da! Aren’t they perfect?? To just hold one it’s obvious that it’s not a “real” brick, as they’re someone chipped/irregular along the edges, but in the pathway, with dirt between them, they flow very well and I am super stoked!!!! And no, to answer your question, we did not install this walkway the “right” way. No sand, no leveling… Tom just raked away the loose stuff and stuck them down in there, and then tamped dirt back in between them. We will probably have to go back and do it a bit better at a later date, but for now they’re there enough that I can plant around them and keep things moving in this area. Gah, aren’t they perfect?? I love them! Where the right-hand path ends is roughly where the little pond will someday end up, so it should tie in with whatever brick/stone ends up around that project. Our other big project this weekend – installing an orchard! We bought four trees yesterday and four more today, and we still have room for two more!! We really wanted to get them planted as it started raining this afternoon and is supposed to keep raining through tomorrow evening, and it’s always nice to give them a good soaking right off the bat. Tom did most of the heavy work for this project (surprise, surprise), but I’m good at things like holding trees steady while dirt gets shoveled around them. 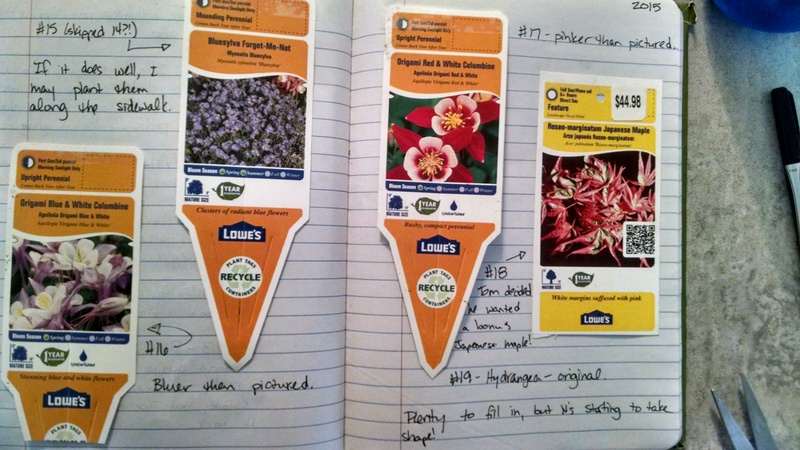 With all this outdoor activity, I was kind of glad when the rain moved in so I could try to get it all caught up in my gardening journal. I started this journal the first spring Tom and I were married (2011), which, incidentally, is the first spring I had my own gardens! I keep the journal in a composition book – they’re great for projects where you want to tape/glue things to the pages. Because the pages are sewn together, you can really stuff the books full without them falling apart! For me, the easiest way is to rough out where things are going, number where stuff is planted, and then number the tags in the book. Anyway, on the map, numbers 1-10 are our fruit trees (well, 7 and 10 are still just fruit tree slots). 12-17 are still in the planning stages, but will probably be various fruit shrubs (blueberries, blackberries, raspberries), and hopefully some hazelnut bushes. 17 will probably be vegetable gardens (although I think we’re legit holding off on veggies until next year… so labor-intensive! 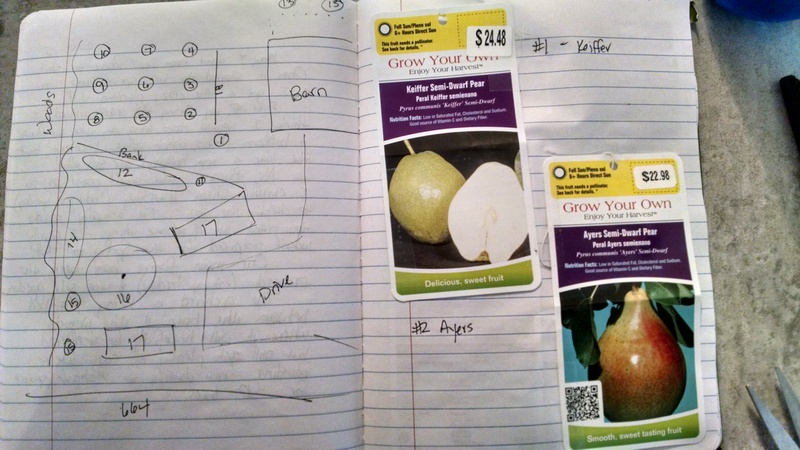 ), and I think we’re going to try to plant English walnuts behind the chicken yard (13, top of the page). 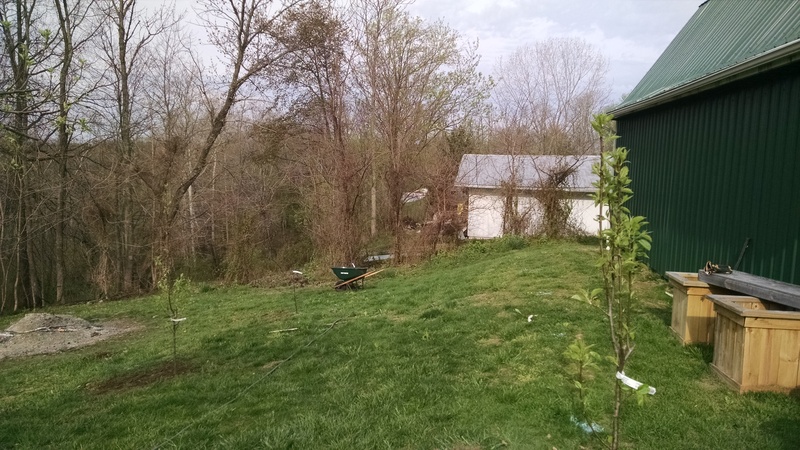 For now, we’ve planted two pears, two plums, three apples, and one (self-pollinating) peach. We’ll probably get one more peach and one more apple, but who knows?? We will see what takes… Lowe’s has a one-year guarantee, and you can bet that this girl is saving her receipts! 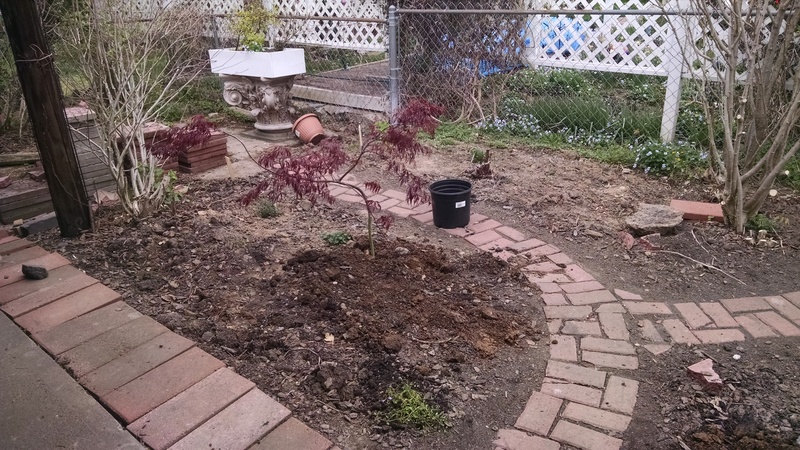 We got a few more things planted in the side garden before the rain as well, including this Japanese maple. Tom really loves these (actually, he bought two, different varieties), so he was really excited about getting them into the landscape.